Is there still a place for brand new, almost HD, TVs? With a Freeview HD tuner, Freetime for catch-up TV, Panasonic's myHomeScreen smart TV apps platform and file-swapping from any phone, the 32CS510 is one of the best connected and best value 32-inchers available – but only if you can stomach a HD-ready resolution. Does anyone remember the HD-ready TV? While Panasonic – like every other TV maker – has gone gung-ho on Ultra HD and fitted most of its new 2015 TVs with 4k panels, this 32-incher gets the opposite treatment. Its 1366 x 768 pixels don't even muster a Full HD image, but what the 32CS510 lacks in dots it makes up for in advanced usability features. For inside the 32CS510 is not only a Freeview HD tuner, but also a Freetime user interface for easy catch-up TV, and Panasonic's slick myHomeScreen smart TV platform. The latter has been surpassed this year on the brand's top-end TVs, but on a 32-inch TV of this low price it still feels like an advanced feature. There's even Swipe and Share, which trades files wirelessly between tablets/phones and the 32CS510. It may be a TV destined for a bedroom, but it's going to be one seriously well-connected den. Physically, the 32CS510 is predictable but impressive. Its 69mm depth isn't mould-breaking, but from the front it looks like a shrunken version of a high-end TV, which isn't at all usual at this level of the market. Around three sides is a gloss black bezel that measures a tiny 10mm, while on the bottom that increases to 20mm because of a metallic panel that stretches right across. The desktop stand is a cut-out, which helps give the 32CS510 a less plastic-dominated look than previous incarnations, but the overall look is no more than business-like. Overall dimensions are 734 x 437 x 69mm – this is a TV with a small footprint. The headline feature on the 32CS510 is undoubtedly Freetime, a smart TV guide from the makers of Freesat which provides a dynamic (and great-looking) platform offering catch-up TV for the last seven days across 26 channels. The chance to roll back through the TV schedules is excellent, and on the 32CS510 Freetime is completely integrated. There's a Freeview HD guide page provided on the TV too, though there's really no need to use it. Ditto the BBC iPlayer app on the 32CS510's myHomeScreen platform. With BBC iPlayer, ITV Player, 4oD and Demand 5 integrated into Freetime, it acts like a built-in YouView. Panasonic's attempt at apps is via its myHomeScreen, a platform that eschews the 2015 trend of depending on pop-ups. Instead, myHomeScreen contains a large live TV preview screen that's ringed with shortcuts to various TV functions, or the whole suite of Freetime services. One of those shortcuts is Apps, a separate screen that includes Netflix, the BBC iPlayer, BBC Sport, BBC News, YouTube, Wuaki.tv, Meteonews TV and Amazon Instant Video. A second page adds a web browser, Eurosport Player, CNBC Real-Time, Aupeo radio, euronews, Facebook, Twitter and AccuWeather.com. If you're wondering where catch-up apps from ITV, Channel 4 and Channel 5 are, don't worry, as they're all rolled-up into Freetime. Only two HDMI inputs? Is that enough in this day and age? How many HDMI inputs does one home need? More than the 32CS510 has, that's for sure. As if to underline that the 32CS510 is purely for use in a bedroom or kitchen, a rear panel offers a mere brace of HDMI inputs. Other slots back there include Ethernet LAN (despite the presence of a Wi-Fi module), an RGB Scart, component video inputs, left/right phonos, an optical digital audio output and an RF in to power the Freeview channels. The side panel isn't much better, supplying only a headphones jack, a single USB slot and a Common Interface slot. On the opposite side of the TV is a recessed panel for hard-button controls for the TV's core functions. 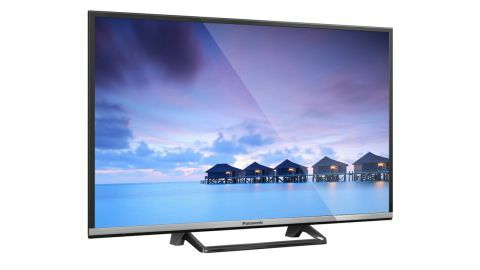 Though 2014's TX-32AS600, TX-32AS500 and TX-32AS400 are still available, Panasonic's line-up for this year includes only one other 32-inch TV, which is pitched slightly above the mid-range TX-32CS510. The TX-32CS600 has a Full HD panel, though still doesn't include the new Firefox OS. How impressive can a HD-ready TV be? It's hardly cutting edge in term of resolution, but the 32CS510 puts in a surprisingly impressive performance. With less upscaling to contend with, images are left looking clean, colourful and full of contrast. There's a choice of Dynamic, Cinema or True Cinema on the 32CS510, while a custom mode lets you tweak the white balance and the full suite of colours. A good shortcut is to use the True Cinema setting and tweak from there. My calibration test disc revealed the 32CS510 to have vivid, well-saturated colours and excellent peak whites, while a play of Gravity on 2D Blu-ray showed-off enough fine detail to impress on the small screen. OK, so it's not Full HD, but the 32CS510 downscales with little loss of clarity on this scale. Contrast is impressive, too, with lots detail and gradation visible within areas of black that would look solid and impenetrable on most LED TVs. It's an image that's surprisingly refined. I did notice some judder in the 32CS510's images, particularly during vertical panning, with the tightly packed lines of some railings becoming indistinguishable. There's also some motion blur – as there is on all LED TVs – during panning shots, and writing on billboards and credits at the end of movies become harder to read. However, news tickers work OK and are also easy to read. I also noticed a touch of dot crawl around graphics during weather forecasts, and some grain in background during really bright scenes. Although the 32CS510 has a 100Hz mode, it's a bit of a fudge, with the native 50Hz panel treated only to some backlight blinking. It works really well, but it's not totally convincing. However, none of these niggles are at all serious, and mostly less noticeable than on a lot of Full HD LED TVs. Switch to Freetime and a standard definition broadcast of the Women's World Cup on BBC Two looks a tad soft, but seems unusually clean. Turn to Earthflight on BBC Two HD and the picture noticeably jumps in detail. It's not jaw-dropping, but it is pristine and involving, which is more than you can say for most mid-range LED TVs. Meanwhile, the viewing angle is remarkably wide whatever the source. Watch from the wings and the 32CS510's panel retains most of the colour and contrast as it had when viewed head-on. Most people find remote controls baffling and confusing, and while Panasonic's remote isn't the simplest, it has been designed with mass-appeal in mind. Buttons are large and well-labelled, with a big white Netflix button above a directional keypad that's all fairly intuitive. The customisation options for myHomeScreen are unique. It's possible to download themes for the entire user interface, with some of the most popular including YouTube, Eurosport, FC Barcelona and various urban landscapes. Watching a live TV panel surrounded by customised widgets isn't particularly nice, but it's great to have your most-used options to call-up as and when, though arguably the Freetime page should be the default. Such customisations don't really work in a living room where multiple people might use a TV, but on a bedroom TV like the 32CS510 it makes a lot more sense. While myHomeScreen is mostly impressive, it's mostly a layer too far. With a Netflix shortcut button already on the remote control and access to all UK catch-up TV offered via Freetime, there's little in myHomeScreen of any consequence. Ditto the electronic programme guide, a standard grid showing seven channels and two hours of schedules for all Freeview HD channels, with a live TV panel in one corner. It's needless duplication that's in danger of making things too complicated for some users. The 32CS510 does well with digital media, though it's rarely a slick experience. Although the software that backs them up is rudimentary, the 32CS510's USB slot and DLNA streaming feature supports sticks and drives holding MKV, AVI, MP4, WMV, WMV HD and FLV video files. Music can be played in MP3, AAC, WMA, FLAC and WAV formats. If you've got MP4 video, photos and MP3/WAV music on a tablet or phone, download the Panasonic Remote 2 app for iOS and you can Swipe and Share files to and from the 32CS510. The sound quality on the 32CS510 is very good. Despite the slim width and depth, its twin 10W speakers offers bold audio that's more than nuanced enough for speech-based news and drama. Movie soundtracks get little pizazz, though stick to the Music mode and there's just enough mid-range to perk things up. If it's all too uniform, the 32CS510 does have a digital optical audio output on its rear that can route everything straight into a home cinema or a soundbar. Since it's built around an HD-ready panel, it's battling supermarket cheapies and no-name brands, so expect a series of imminent price-cuts. It should be possible to get the 32CS510 for under £300 soon enough – and that's an excellent price considering its features and all-round versatility.